Lovely and classic indeed, thanks for sharing! Thanks so much! It's been a while since you've commented! Jenn, thanks! And, yes, do make this recipe first; you can't miss with it. Okay, Jean--I'm going to treat my Scone-loving husband to a Delightful Repast Scone. I have never been a scone fan but my hubby always orders them when we're out. Won't he be surprised when he comes home to some of his favorite treats! I will put walnuts and dried apricots in them--a winning combination. And I have to say, zest of meyer lemon makes all baked goods better! They sound and look incredible, Jean. Butter? No butter? Butter makes it better. My minimalist bread consumption, as a dietary element, is made easier by dry breads. With the possible exception of a sourdough biscuit, I just have no taste buds for breads that aren’t sponges for something inclusive in the making. Butter is one of those inclusive and redeeming aspects for me. If it chews like Matzo, it needs to be soaked in something besides one’s own spit. Yes, I grew up liking PBJ sandwiches made with nutritionally useless Wonder bread simply because you could roll a slice up into a moist ball – not that I ever did, but it was THAT moist. Admittedly, scones are a flat-out mystery to me; but the fact that they rhyme with stones is not lost… Just sayin’. Sue, let me know how he likes them. Also, you might make my other scone (with butter, buttermilk and egg) for him, too, for comparison. Wish I had some walnuts and dried apricots in the house right now! Mmm. Your scones look sensational! How tragic not to have tasted a delicious, moist scone (Sully)! 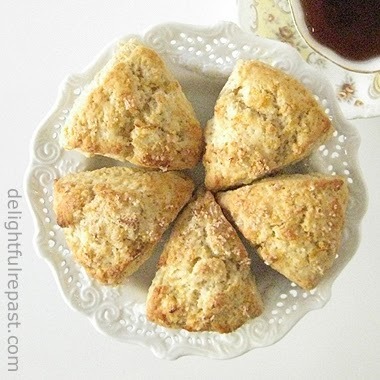 I absolutely adore scones, but I have never tried them without butter, milk or eggs! Craziness! Now that you ask, I am craving a sinful pumpkin score...or maybe orange. Thanks, Lindsey! I think my favorite scones have orange zest and tiny currants. These sound and look just super, Jean. I do love a good scone. Don't know if you've ever tried, but I also like to slice leftover scones and lightly toast them in the toaster. My kids used to love them this way. Denise, thank you! I'm sure I'd love them reheated in the toaster like that, if only I ever had any left over! Okay, Sully, you have shown adequate remorse and willingness to eat good food, so you can now be released! Thanks, Greg! Yes, my scones are definitely different from my biscuits. But why did you have to remind me of dumplings?! Now I'm craving them! Thanks, Amy! Isn't it wonderful when easy and good go together?! Love that I don't have to get butter all over my fingers. I'm saving this one to try. Pauline, thank you! I'll be curious to hear how you like them. I'm always in the mood for tea and scones. Also, love the high tea. I'm in Calgary, Alberta, Canada, not a particularly English place for high teas though. You have a delightful blog here. I'm sure I'll stop by for more. BTW, any madeleines? After reading Proust, I have tea and madeleines in my mind all the time. :) Thanks for stopping by Ripple Effects. Let's chat again when the next episode of Downton airs. Arti, thank you so much! No, I've never blogged about madeleines. Usually stick to English and Southern food, but have thought madeleines would fit right in really. I'll add it to my list. What an interesting recipe. I wish you were here to help polish the silver. There's over 100 pieces and my fingers are getting sore!!! And I would! Together we could whip out 100 pieces, in two sets, with a finger rest and tea break in between! I did a savoury version because I wanted to serve these with dinner, and they turned out fantastic, soft and light. This is an excellent, super-easy recipe and it turned out to be as easily adaptable as I hoped! Katya, thanks! That sounds wonderful, especially with the extra cheese and chili flakes. Glad you caught them before they burned! Love the scones! But the bottom burned a lot. The second time I made it, I shorten the time. The bottom still came out burnt, but not as much and the top didn't come out golden brown. Anonymous, I'm glad you like the scones. It sounds like your oven might run a little too high. Maybe you can try turning it down by 25 to 50 degrees and see what happens. Also, baking sheets are different. Did you use parchment paper on the baking sheet? That (or a Silpat) has a bit of an insulating effect. Let's figure this out! Hi, I lower the temp 25 degree. They came out really nice. Thank you! Oh good! I thought that would probably take care of the problem. Many people's ovens run hotter than indicated. If you have a gas stove, I've heard you can call the gas company and someone will come out and calibrate it free of charge. Thanks for the tip about the gas company, but my oven is electric. I will pass the info to other that might have that problem. Thanks again, about to make these delicious scones again. I'm not sure if the electric company has the same free service or if you would have to pay someone, but I'd definitely look into it. So glad you're enjoying the scones! Normally I make scones which are healthy but lack both great texture and tastiness. These hit the point between bakery fattening and home made healthy really well. I used dates for my fruit, and the low side of the sugar. Instead of wedges I did 12 rounds, which gives me evener portion control. The cream really gave them great texture. And so simple. Great recipe! Jan, I'm so glad you liked them! I always use the lesser amount of sugar, too. I made them a couple weeks ago after making clotted cream. To make a half pint of clotted cream, you start with a pint. Then when you skim off the clotted cream, you have a cup of cream to be used in a recipe. Jean, I just happen to have a cup of heavy cream left over. Thanks to your recipe, we shall have scones this evening! Margaret, that's lovely! Let me know how they turn out for you. I made raspberry muffins today instead of scones, so watch for those next week. I made these tonight and the dough came out more like a batter -- extremely wet and sticky and certainly not cohesive enough to cut into pieces before baking. All the measurements were correct, but it seemed like either too much liquid or not enough flour. I added a good bit more flour in an attempt to form them as directed, but it didn't really work. I got two giant scones instead of a dozen small ones. That said, they still were good with homemade clotted cream. Heidi, I'm not sure what happened. Probably differences in flour or in cream consistency. Probably a good idea to not add all the liquid at once -- maybe start with the vanilla extract and half the cream, then add in as much as you need. That might be easier than trying to mix in extra flour. If you try it again, do let me know. Flour has a mind of its own. Even when weighing flour, and eliminating the inconsistencies of measuring, it can act differently according to the weather. Thanks very much for taking the time to reply. After the batch was in the oven, I went so far as to re-measure the same amount of flour and weigh it to check it against the weight you provided, and it was very close -- only about 10 grams'difference. Next time I'll start with less liquid. BTW, for the dried fruit I chopped up some dried Mandarin orange segments. It was very tasty. Super, Heidi! I'll have to try drying some Mandarins sometime as I don't think I've ever seen dried Mandarins in the shops. Love that flavor! Not sure if it's an option for you, but I got mine at Trader Joe's. Thanks, Heidi. I'll look for them! So true, Joan! It's *all* good!